Let's celebrate Christmas together on Saturday, December 4th at the Thornburgh's in Gualo Rai (5-9pm)! It's a time to thank the Lord for our marriages and families in addition to reuniting with the ME community and sharing an evening together. Let's eat, drink and be merry! We'll also have a potluck, white elephant gift exchange (used or new with $10 limit) and lots of fun! It is for Couples only! 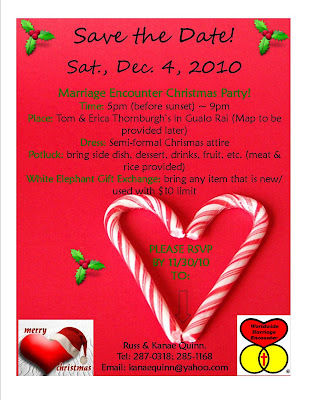 Please RSVP Russ & Kanae Quinn by 11/30 to kanaequinn@yahoo.com!